The full power of 360 degree feedback comes after the report has been created. It’s when the participant really starts to apply the my360plus feedback in their world. In fact, reports are a waste of paper unless and until the messages get taken on board and tested in real-world situations. The paper or pdf report is a great tool. And the feedback we get from our line manager or coach is useful too. But the challenge is to keep up the pace after that initial feedback session. This is where my360plus has the edge. My360plus doesn’t stop with a paper report. Participants get access to a fully-interactive personal development site to explore their profile, decide on their development goal, to share with their network, for ongoing feedback. That’s why we say my360plus is unique. You can see more of the great features in these short videos. The online feedback process leads naturally into practical continuous development so you really get a return on you investment in my360plus. 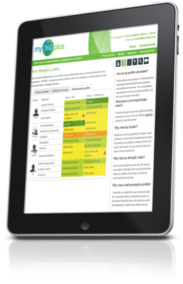 Participants receive a personalised digital report (pdf) with clear explanations, a workbook, coaching tools and action planner. They can set short- or long-term goals and invite feedback from their observers. Strengths-based. The report uses strengths rather than numbers, in addition to easy-to-understand visuals of participants’ results. Excellence benchmark. The report benchmarks the participant against people with similar roles, operating at high levels within that role. Which means that participants can compare themselves to others with similar levels of responsibility. Addresses limitations. It reports on limitations objectively, so participants know where to put their development effort. It also means they can plan their longer term growth. If you want to find out more about the power of my360plus feedback, get a free live demo today. Helen is an author, Professional Leadership Coach, Chartered Marketer and exam assessor for the International Coach Federation and the Chartered Management Institute. When not writing about leadership, coaching and 360 feedback tools, Helen looks after the greenhouse, enjoys sewing and meditating.